We all remember snail mail, actually there are those times when you still have to use it from time to time. Cards are still way more fun to get as snail mail than receiving some cheesy E-Card. Well for anyone that carries mail to people for a living, now you can have a bag that looks exactly like the things it carries within. Of course for those of you that are very addicted to your email messages, one side of the bag is made to look like the email icon we all know and love. 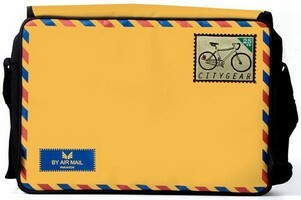 Then on the front of the bag it looks like an air mail envelope. It’s supposed to be something very deep and meaningful, like a wearable metaphor or something along those lines. I doubt most people will see it that way, but perhaps the occasional “deep” human being will respect you more for your taste in fashion accessories. You can purchase one of these bags for $130.